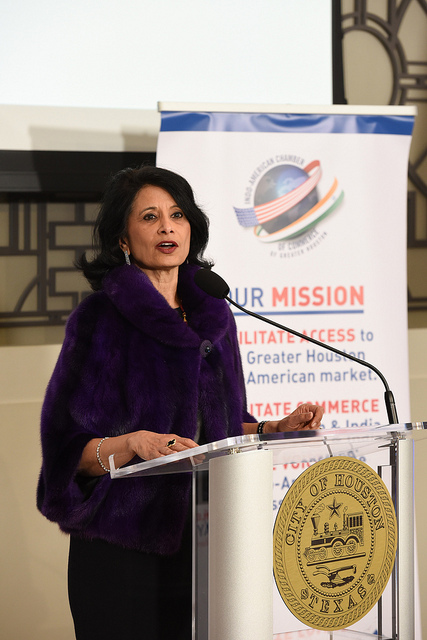 The Indo-American Chamber of Commerce of Greater Houston is proud to celebrate 20 years of Excellence. IACCGH’s primary focus is on local economic development and creating local jobs through empowering small and medium enterprises and professionals. 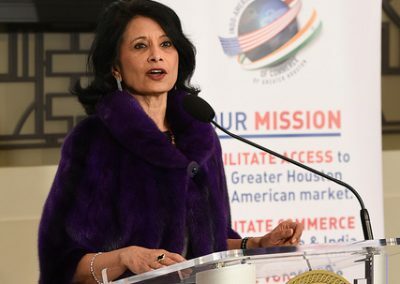 Leveraging the powerful “India Advantage” the Chamber facilitates trade between the United States of America and India. 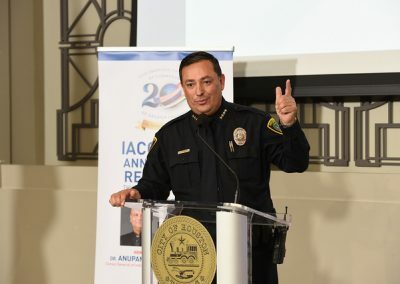 The Chamber has achieved steady growth through innovation and robust leadership over the course of two decades. 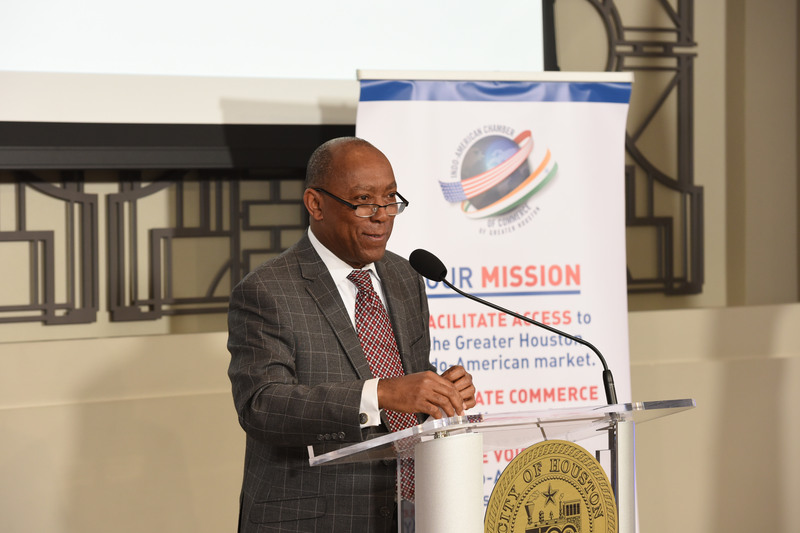 The Chamber commemorated the start of its 20th Anniversary at the Houston City Hall with the Guests of Honor Mayor Sylvester Turner and Indian Consul General Dr Anupam Ray. It was attended by over 170 members and supporters of the Chamber, representatives of the other local chambers and resource partners the Chamber works with including the Greater Houston Partnership and the Confederation of Indian Industries whose representative flew in from Washington. 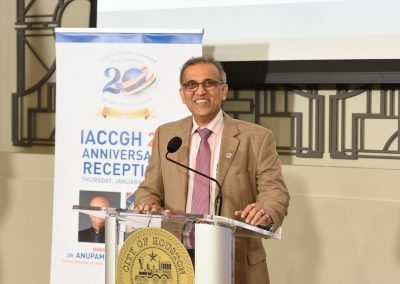 IACCGH Advisors Dr Anupam Ray, Dr David Leebron, Dr Renu Khator, Dr Durga Agrawal and Vijay Goradia were joined by Houston Police Chief Art Acevedo, Judge Ravi Sandill , Councilmember Himesh Gandhi, HCC Trustee Neeta Sane, Senator John Cornyn representative Jay Guerrero and Senator Ted Cruz representative Jason Fuller, Andy Icken Chief Economic Development Officer City of Houston, Michael Wolfe City of Hempstead Mayor, Congresswoman Sheila Jackson Lee representative in congratulating the Chamber on its anniversary and thanking it for its service to the community. 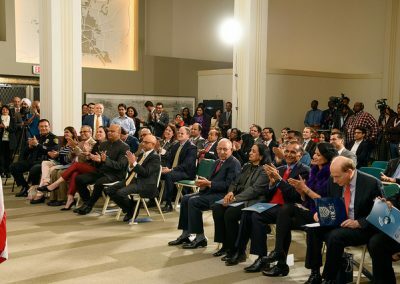 Other community leaders who were in attendance were Colonel Raj Bhalla, Asif Dakri, Sanjay Jain, Nisha Mirani, Charlie Patel, Manisha Gandhi, Murad Ajani, Nagraj Eleswarapu, Ash Shah, Asha Dhume, Dr Prasun Jalal & Saeed Pathan. President Swapan Dhairyawan in his speech thanked the past Presidents, naming each for their contribution in building the Chamber to its current stature in the community and shared the success of 2018 and also outlining his plans for 2019. 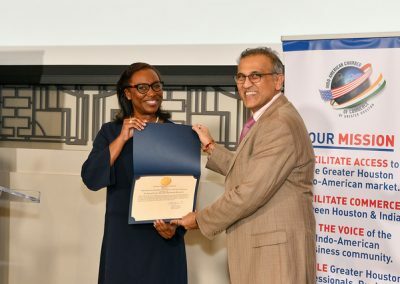 The current Board and the Directors at Large were joined by major supporters Shell and Halliburton in a group picture when the Chamber formally announced a Lifetime Achievement Award to be presented to Dr Durga Agrawal at the 2019 Gala. The event was catered by Dawaat Catering, a division of Madras Pavilion. 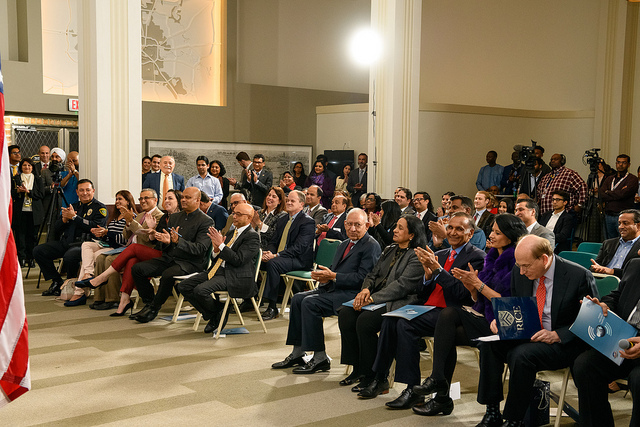 Kijana Wiseman led the singing of the US and Indian National Anthems. A minutes silence was observed in memory of IACCGH Advisor John Mendelsohn. 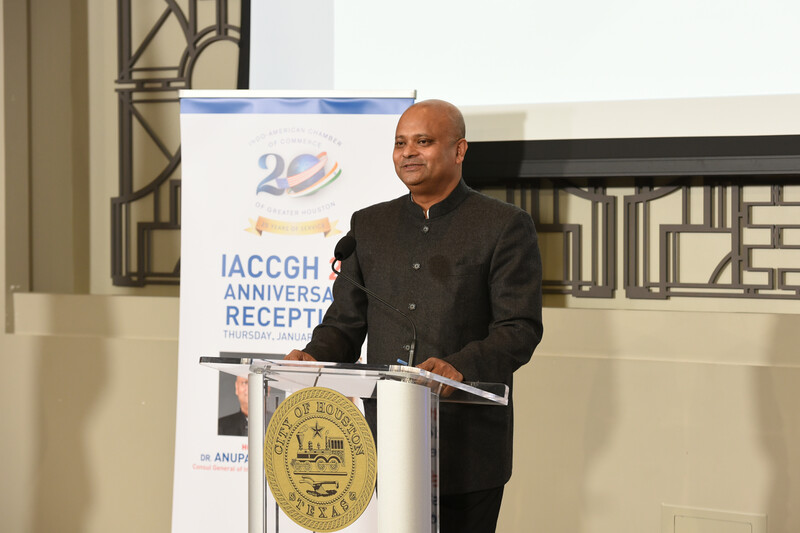 Twenty years ago a group of local Indo-American businessmen and professionals met the then Consul General of India in Houston and discussed the need to create an Indo-American Chamber of Commerce to serve our region. The group saw the role India would play in the emerging global economy and wanted to help leverage the India Advantage to help grow our local economy. 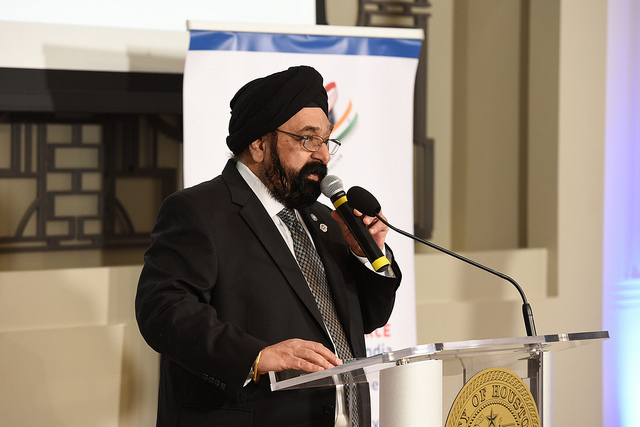 The Chamber was chartered in 1999 with Dr Durga Agrawal as President, Jagdip Ahluwalia as Secretary and Jitu Shah CPA as Treasurer. 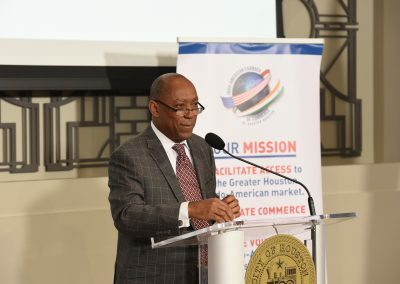 Consul General Wangdi was the first Advisor and was later joined by eminent local leaders like Compaq’s CEO Michael Capellas, Rice University President Malcolm Gillis, Memorial Hermann President Dan Wolterman and Continental Airlines Chairman Larry Kellner. Over the years the Chamber kept evolving to address the changing needs of the community.